USA America Holidays provides you with all the information and advice you will need for a holiday Stateside. 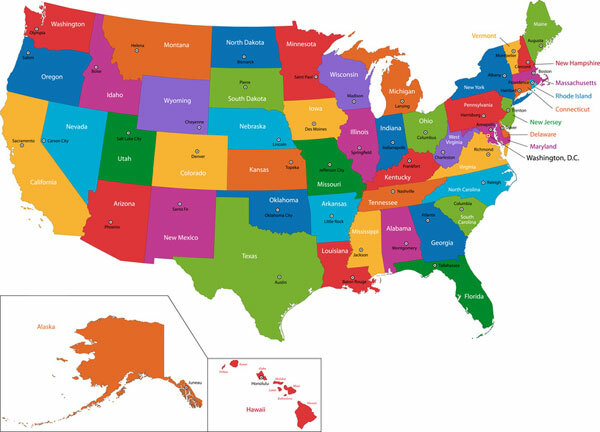 The United States of America (USA) is a huge country - which is made up of 50 states, offering a huge choice to those looking for a vacation rental or self catering holiday. The USA covers an expansive area making it one of the largest counties in the world. By virtue of this, states can vary hugely in terms of their landscapes and climates. One state within the USA for example, Alaska, which is situated near to Canada, has a cold harsh climate, compare this to the state of Florida with its much sunnier and warmer climate. States can be huge distances apart meaning it can take hours and hours to fly from one side of the USA to the other, for example a flight from Boston to Seattle takes around 8 hours. Many dream of travelling around the USA, on a road trip perhaps? However, unless you have a year of travelling to plan, with such a huge country to explore you may be best holidaying in one state or aiming to explore one or two states on your self catering holiday. The good news is that the USA has so much to offer for self catering holidays and that every state offers visitors something different. Which one(s) will you visit? If you're looking for some inspiration click on Places to Visit to find out more about each state in the USA. Click on Accommodation to find a vacation rental such as a self-catering villa, apartment, log cabin or house for your holiday to the United States or click to find self catering accommodation in the UK and holiday rentals abroad. Explore the USA at your leisure with the pleasure of returning to your own holiday home in the evening. Browse the pages on USA America Holidays to find out more information about a self-catering holiday here.